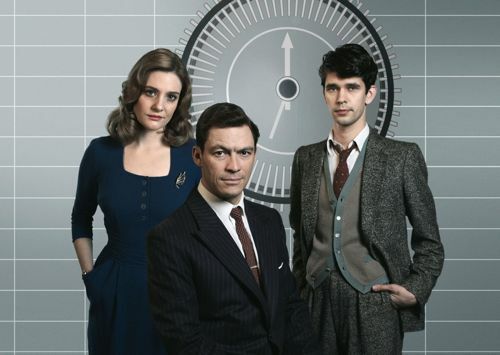 So begins The Hour, a fascinating new BBC2 drama series set in the changing media and political world of the 1950s. Episode one finds the BBC News at London’s Alexandra Palace still fixated with reporting on the daily lives of society darlings. 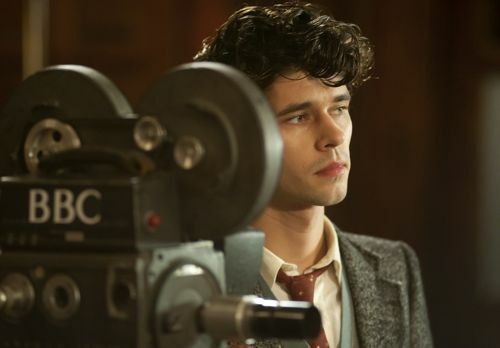 Frustrated TV news reporter Freddie Lyon (Ben Whishaw), working alongside Bel Rowley (Romola Garai) knows there are far more important stories to tell. Both seize their chance with a move to Lime Grove studios in west London, heralding the dawn on a modern and questioning topical news programme called The Hour. 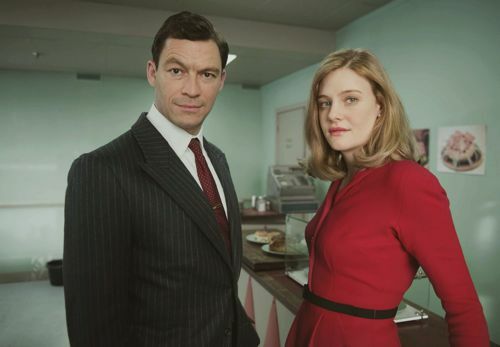 It will be fronted by “face of tomorrow” Hector Madden (Dominic West), paving the way for a new era of television news. The Hour begins a few months before the October 1956 Suez Crisis and includes a dark thriller element – watch out for a few shocks in the opening hour. Critics already appeared divided by this six-part Kudos series, which begins at 9pm tomorrow (Tuesday) night. For what it’s worth, I loved the first episode. I saw it at a special BAFTA premiere in London on May 11, which was followed by an on stage Q&A session. Taking part were writer Abi Morgan, lead director Coky Giedroyc, Romola Garai, Dominic West, executive producer Jane Featherstone and chair Maggie Brown. Below are the edited highlights of what they said. You can also check out details of all the characters here. 1. Is the storyline about the BBC’s clash with the government partly true? Jane Featherstone: “The Suez incident is obviously true and that’s background. But what Abi’s done, and it’s really all down to Abi – she’s created the world, the characters and the universe that you’ve just seen. So we did a lot of research and Abi did a lot of research herself. 2. There weren’t many powerful women in news and current affairs in the 1950s Was Grace Wyndham Goldie (who became the BBC’s Head of News and Current Affairs), one of the inspirations for Bel? Abi Morgan: “There were only a handful of women working at the BBC at that time. And so you couldn’t really circumnavigate Grace Wyndham Goldie because she was in many ways a pioneer and she had such a great energy. I didn’t want to do a parody of her. She was very much for me, in essence, the kind of kick off point for the character of Bel. And more than anything it was just very inspiring to find a woman like that. Not only working within the BBC but was also at the helm of a show. So I certainly feel that the genesis of that character has been inspired by her. Coky Giedroyc: “I felt really strongly that this piece is gorgeous and thrilling at the same time. And I wanted the period to feel really textured and lush and colourful and rich and to go on a journey in episode one from the dark, shadowy Alexandra Palace to the bright new modernity of Lime Grove. So I was really keen to get that absolutely right with Eve Stewart, our brilliant designer, and costume and make-up. 3. Parts are visually funny, plus scripted humour? 4. Dominic – this bridges two worlds. Both old school and new school BBC? 5. He’s involved in a love triangle? 6. Romola – what attracted you to the part? Dominic – how did you feel about having your character described as a pretty boy at one point, and being this sort of poster boy? And what about the smoking that takes place in this drama? Were they real cigarettes? Did they not give you a copy of it as a memento? Everyone chain smokes and drinks like fishes? Coky – parts of it were claustrophobic. Was that deliberate? Will there be lots of stories or one story? Is there a plan that this might be a returning series? Are both Dominic and Romola optioned? Abi – what were the main challenges writing those six hours? Abi Morgan: “It was bloody hard work. I think I was quite arrogant to think that…to be absolutely honest, I had a fantastic creative team. I know that people always use this slight blanket statement but it was really true and I think when you’re navigating your way through a very complex thriller like this…they were a very key team. So I think they really kept my eyes open with matchsticks and just kept me going. Because it is a maze and you do tie yourself up in knots. 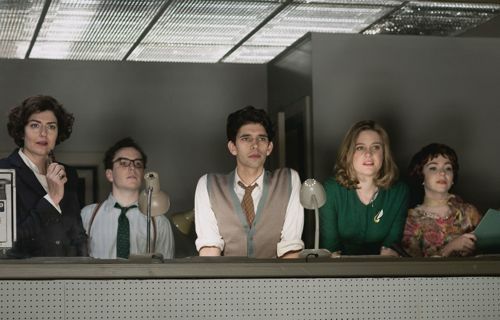 “The inspiration for this was very much, His Girl Friday and Broadcast News. But there was also, for me, All The President’s Men and Network and even a little bit of Jagged Edge there. So I was quite inspired by a lot of movies and I wanted a piece that had a sense of thrill. But that does take a lot of plotting. So there’s a lot of riddle-making that goes on in it. I think the creative team were very good at pulling me back. “The joy of working on a six-part thing was just surprising because the creative team, we were all in one building. So it was an incredible thing to be working on episode four and then watching your episode one and two being filmed in the next room. So you would have the opportunity of, say, seeing Dominic doing something brilliant and think, ‘Well, I want more of that.’ Or seeing Romola portray something you didn’t think she was going to do. And so that was very exciting to start to feed that into the writing process as well. Suez began in 1956 So World War Two was pretty recent? Time of change? Older male characters would have had a war background? Getting the period detail just right? She also explained how one of the main locations was Hornsey Town Hall in London, a listed 1930s’ building, full of period details offering offices, corridors and a huge studio space. Posted in News and tagged Abi Morgan, BBC Two, Ben Whishaw, Coky Giedroyc, Dominic West, Grace Wyndham Goldie, Jane Keatherstone, Kudos Film and TV, Romola Garai, The Hour. Bookmark the permalink. I’ve enjoyed the first 2eps of this. The amount of detail for the look of the show is brilliant!!! Overall so far enjoyable. I have enjoyed it, too. 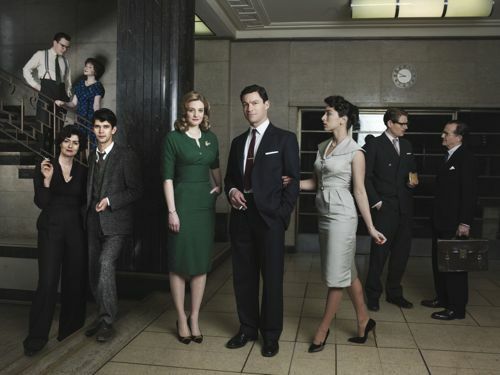 I must be one of the few people in the country who hasn’t seen Mad Men, so I don’t really understand the unfavourable comparisons between the two programmes. 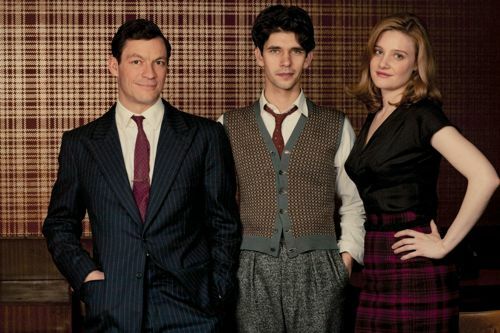 To me, The Hour is well-written, has an excellent cast, and a plot that’s kept me intrigued for the first two episodes. What more does anyone need?